When better to start your Christmas cards, than July! If I keep this up, I may actually have mine ready to mail early, instead of scrambling at the last minute to get them out the door! 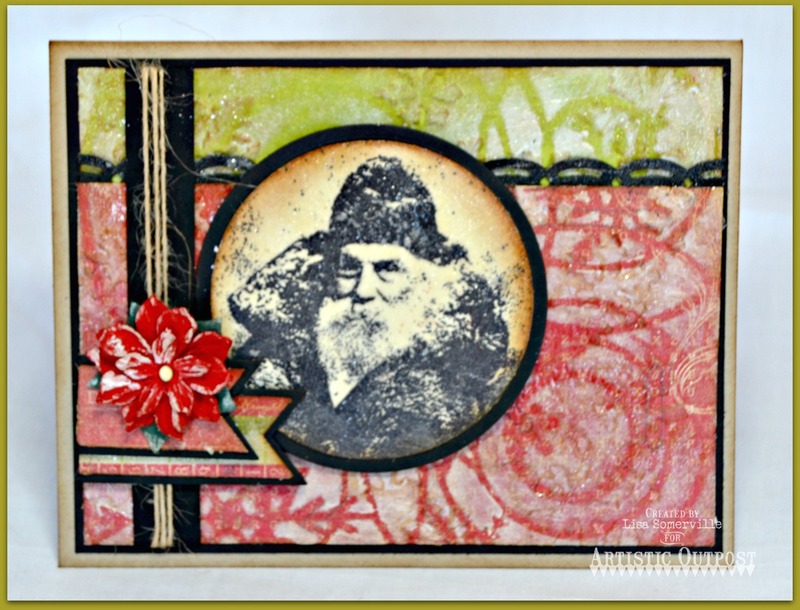 Inspired by the Mojo Monday Sketch Challenge, I created my Mixed Media card using one of my favorite images from the Artistic Outpost Snowy Woods plate. I stamped the image in Black Archival on a scrap of Authentique pattern paper, die cut the panel with Spellbinders Circle Dies, then sponged the edges with Ranger Gathered Twigs Distress Ink to age the panel. Wanting to add a bit more aging, I applied Ranger Crackle paint, and sprinkled on some Dry Glitter for added sparkle. The papers from the Authentique paper pad, where a bit bright for my vintage card, so I applied Gesso to a Snowflake Stencil, once dry, I embossed the panel with a Snowflake Embossing Folder, and sponged the raised area with Gathered Twigs Distress Inks. Again, wanting to age the panels further, I applied Crackle Paint and Dry Glitter. To embellish, I die cut the fishtail panels using the ODBD Custom Pennants Die from Black card stock and scraps of pattern paper, adhered Black Ribbon with Twine accented with a Poinsettia, and the added the Black scallop border using the ODBD Custom Beautiful Borders Dies. If you're looking to get a jump start on your Christmas projects, for a limited time you can save 25% on all Christmas/Winter stamp plates at Artistic Outpost. Click here for more details! AO's parent and sister companies, Our Daily Bread Designs and North Coast Creations are also having their Christmas in July Sale!